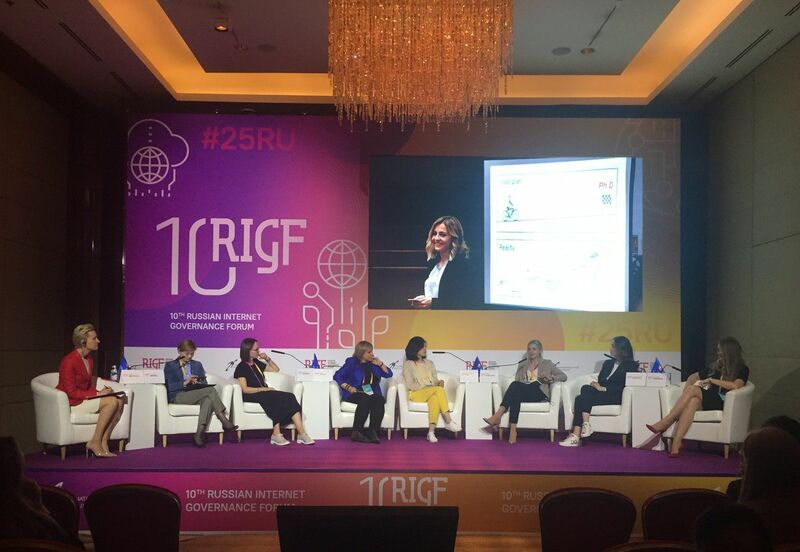 April 8, in the framework of the 10th Russian Internet Governance Forum, a panel session entitled “Women Leaders of the IT Industry: Success Stories” was held. The event was attended by Ludmila Bokova, First Deputy Chairman of the Council of the Federation Council Committee on Constitutional Legislation and State Construction, Olga Kavalli, President of the South School of Internet Governance, Nina Angelovska, founder of Grouper.mk, Elena Volodina, Project Manager Lady Mail.ru, co-founder and Development Director of SETTERS Alexandra Zharkova, general director of iTrack Ekaterina Kim and founder of the international school of programming CODDY Oksana Selendeeva. 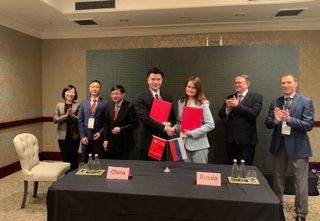 The session was moderated by the founder and chairman of the board of directors of Global Rus Trade, the head of the working group for digital economy from Russia at the BRICS Business Council, Anna Nesterova. The speakers shared stories on building a successful IT career, and also discussed the importance of enhancing digital literacy and developing female entrepreneurship. 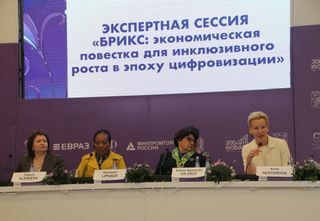 Anna Nesterova noted the need to involve women in IT and the digital economy. For these purposes, various projects are being implemented all over the world. 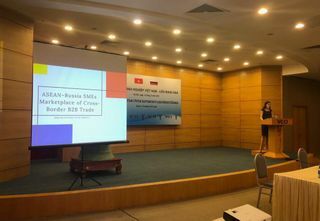 As an example, Anna cited the girls' social education IT project of the company Global Rus Trade, which is aimed at developing the digital skills of girls from the period of early vocational guidance. 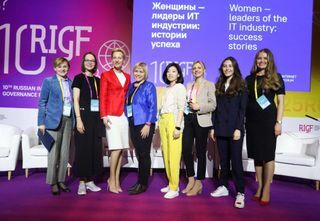 Lyudmila Bokova drew attention to the need to develop business platforms that enable all women to create flexible schedules and work remotely. Lyudmila also highlighted the activities of the Federation Council in support of women's initiatives. Thus, a broad discussion of promising international projects is regularly held on the margins of the Eurasian Women's Forum, of which the Federation Council is co-organized. Olga Cavalli stressed that a greater number of women in companies, including in the field of IT, increases the success and effectiveness of the team. Olga emphasized that a career for women in IT, as in one of the most promising industries, is the path to financial independence and self-realization. Nina Angelovska shared her story of building a career in the e-commerce sector and touched on the theme of the “glass ceiling”: doubting their strength and knowledge, women themselves limit their possibilities. One of the main tools for success is a focus on results and self-confidence. Elena Volodina, on her own example, said that humanitarian education can be an excellent base for a career in IT. Elena noted that specialists with different skills are in demand on the labor market, for this reason it is necessary to regularly receive new knowledge. 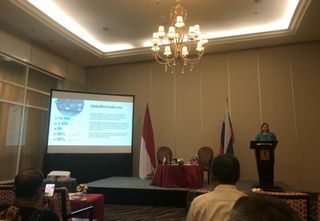 Alexandra Zharkova in her speech noted that digital is the most rapidly developing field of IT, therefore it is important to constantly update knowledge in this area. For this purpose, an educational department has been created at the Alexandra Agency, whose main task is the development of digital skills among digital and social media professionals. At the end of the discussion, Anna Nesterova outlined the need to develop practical tools that will facilitate the involvement of women in IT and the development of their digital literacy. Such a tool, according to all speakers, can be a community of IT sector professionals, which will facilitate the process of finding employees, mentors and partners.